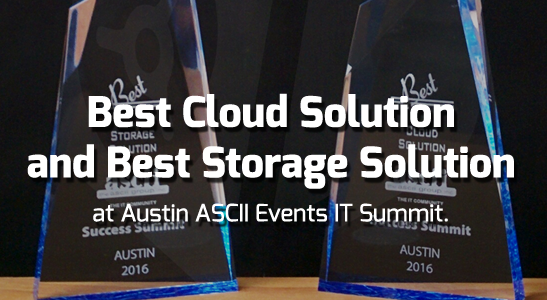 Data Deposit Box Awarded Best Cloud Solution and Best Storage Solution at Austin ASCII Events IT Summit. Data Deposit Box Awarded Best Cloud Solution and Best Storage Solution at Austin ASCII Events IT Summit. Data Deposit Box presented to over 150 Austin area MSP’s, detailing our new Smart Storage and cloud backup products which provide an end to end solution for MSP’s and the SMB’s they support. After a great pavilion and 25min keynote, the Austin partners voted and awarded DDB the Best Cloud Solution and the Best Storage Solution awards! We are very proud of this accomplishment especially considering the competition at the event (Datto, Carbonite and Storage Craft); all fantastic providers with great products. Thank you to everyone who voted for DDB!! https://datadepositbox.com/wp-content/uploads/2016/02/blog-award-image.png 300 547 datdepbox https://datadepositbox.com/wp-content/uploads/2018/08/datadepositbox-logo.png datdepbox2016-02-23 15:52:362016-02-23 15:52:36Data Deposit Box Awarded Best Cloud Solution and Best Storage Solution at Austin ASCII Events IT Summit.